Thanks for the trip of a lifetime! Last week was the best - the scenery, new friends made & riding a bike......how can it get any better?!! 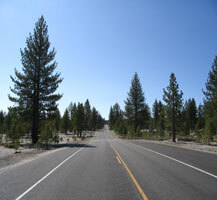 Starting just south of Reno at Topaz Lake, this summer bicycle tour winds along the eastern edge of the Sierras on our way to Mammoth Lakes and Yosemite National Park in California. Mammoth resembles many popular European destinations with it's four lakes and spectacular 12,000' mountains looming above. On this cycling vacation we'll also visit the ghost town of Bodie, conquer Tioga Pass, and ride the popular Sierra Fall Century Route. Because of the elevations we reach, this bicycle tour is held in June after the snow melts. 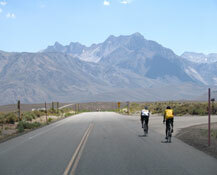 On this bicycle tour we meet at Topaz Lake, NV on Sunday and start riding Monday morning. Fly into Reno, where a shuttle will pick you up at 2:00PM and take you to the ride start at Topaz Lake. After checking into our hotel, you'll have the chance to get settled in and set up your bike. At an early evening orientation we'll provide an overview for the week, make introductions, and answer any questions you have. The Tour starts in Topaz, California, Gateway to the famous "Death Ride" challenge. 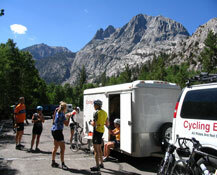 From there we ride along the towering Sierras to Mono Lake, and then Mammoth Lakes, our base camp for the next 3 days. Mono Lake is a geological wonder with it's "Tufa" rising from the waters like ghostly sentinals. Explore the sidebar to the left for links to Mono Lake and other parks on the route. 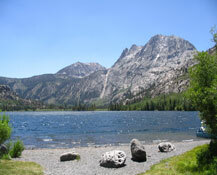 The following day we'll ride around scenic June Lake Loop, a chain of four lakes surrounded by towering granite crags. You'll be hard pressed to decide if you are riding in the Sierras or the Alps! After looping the four lakes, climb through a volcanic lava flow to the resort town of Mammoth Lakes, and then on toward the Ansel Adams Wilderness area. During our stay in Mammoth take the time to visit Devil's Postpile National Monument, where unique six-sided rock columns of basalt were formed 100,000 years ago, and nearby Rainbow Falls, which drops 101 feet into the mist. Today we ride the Sierra Fall Century, a classic in this area for the last 14 years. 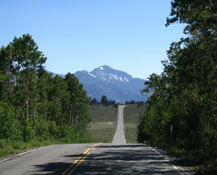 The route takes riders along the spectacular east side of the High Sierra and into the quiet beauty of the Mono Basin. You'll be treated to views of Mono Lake and the White Mountains, and enjoy 100 miles of road with no stoplights and just one stop sign! Aside from the 6,500 feet of elevation gain, we'll ride by Mono Lake and its delicate Tufa Towers, the Mono Craters, the largest Jeffrey Pine forest in the world, and Black Point, the largest now-exposed underwater volcano in the world. 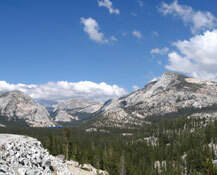 Get ready for another big day as we ride up 9,945' Tioga Pass, the state's highest auto pass. During the Ice Age, this region lay buried under 2,000 feet of ice, and all the ponds, domes and horned peaks were carved by glaciers. After climbing this monster pass, we'll have lunch in Yosemite National Park where the views can't be beat! But first you have to conquer extended 8-10% grades for 10 miles of relentless climbing. On the 6th day we leave the Lakes region and head to Bodie Ghost Town. With the discovery of gold in 1859, Bodie started with about 20 miners and grew to an estimated 10,000 people by 1880! With 170 original historic buildings, this state park is a genuine California gold-mining ghost town. We'll stop and explore Bodie before continuing our ride back to the lakeside town of Topaz. On the last day of this cycling vacation we ride back to alpine County and over 8,314' Monitor Pass to Markleeville, starting point of the famous Death Ride. Known as the toughest of the 5 passes of the Death Ride, the climb over Monitor Pass is an average 6-8% grade for 9 miles. From the top you'll be rewarded with views of the Sierras as far as the eye can see. Prepare for the 10 mile, 10% descent to the bottom before riding along a beautiful winding river to Markleville and lunch. Today we say goodbye to our new cycling friends, and for those with flights, an early morning departure for Reno. Copyright © 2004-2016 Cycling Escapes. All rights reserved.